Matt Forrest Esenwine hosts us today on Poetry Friday. Visit his website Radio, Rhythm & Rhyme, to celebrate that recent life's challenges have changed for the better, his first book deal, and the poem he's written about spring romance in the woods! Congratulations, Matt, sounds like it's been a good week! Then, check out all the other links. Jone MacCulloch at Check it Out had students write "what it knows" poems and put them on postcards to send out to other poets. I received this wonderful poem about the tragedy of Pompeii and what it knows. Although historically fascinating, there isn't much positive to say about Pompeii erupting and its victims. I enjoyed thinking about this tragedy again when I received the poem card, and appreciate the thoughts that Ruben included. He imagines the scene beautifully, with lots of action that I'm not sure I've ever considered. Usually I have read and tried to imagine the terrible plight of the living things there, and after the end, not during. Those people in Pompeii knew more than one terrible things, but hopefully they knew it briefly. 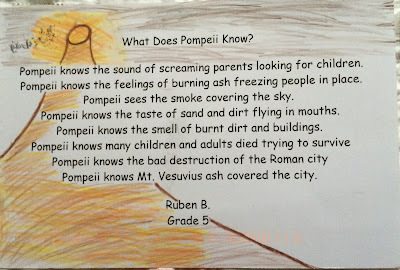 Thanks to Ruben for helping me consider new ideas about Pompeii in his wonderful poem. A haunting poem - great talent for a fifth grader! Thank you for sharing it with us. It was a wonderful thing to find in my mail! Thanks, Sally. Weren't these just the best? I really enjoyed receiving my poem, too. They got a lot of information and the feeling of what it must have been like in these! Yes, wonderful, I am impressed with the knowledge. I liked yours, too, Donna! Thanks! Thanks for sharing Ruben's poem -- his images are riveting! Thanks, Jama, it's a pleasure to share from these poem surprises! Missed you the past couple weeks, Linda. What a powerful poem! I love how by using the Deeper Wisdom form in the classroom, students were able to put themselves into history and describe events with such specific, sensory detail. Yes, they did well. I love the connection to history. I have been on a school trip with my students & then the year is crazy at the end-so busy. I'm working on a poem for you! I also received a poem postcard from Jone's poetry project and was very impressed with it. Even my husband commented on the presentation. 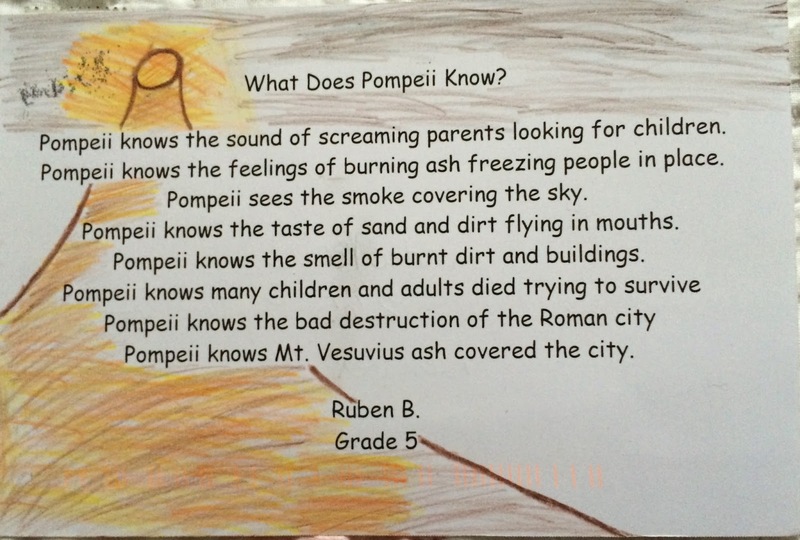 The poem that Ruben wrote was filled with emotion about what the scene in Pompeii must have been like. Thank you for sharing that and Matt's good news. Although I started my Poetry Friday post a few days ago, I have had long days so my post will be late. Thanks, Carol, I really was impressed too with Ruben's writing, and the fact that he helped me think of this ancient tragedy in a different way. Pompeii knows, but does Pompeii feel??? A question for poets' imagination? Thanks, Mary Lee. I, too, so appreciated my card from one of Jone's students... I need to get back with her about that! Thank you for sharing Ruben's poem, Linda. "...the taste of sand and dirt flying in mouths" - what an effective line. Yes - very thoughtful students!